I’ve yet to post anything of substance about tires, but amongst my gearhead buddies I have a well-earned reputation as a light-truck tire aficionado. This started a few years ago when I was writing several articles a year for the Power Stroke Registry magazine, including a few tire reviews. It continued with a new Jeep, then a couple Toyotas, and in addition to my own wear data I’m collecting information from a couple guys running my favorite tread. But this is not a post about tires, it’s even more primal than truck tires; it’s about wheels. Unless you want to constantly swap new tires on one set of wheels, the best way to test tires is to have more wheels. We have plenty of spare wheels for the older trucks in our small fleet of 4x4s, but the newest rig had only the set it came with. I was not actively looking for wheels when my friend Charlie sent me a message saying there were some wheels for my truck on our local Craigslist. According to the advertisement these Toyota take-off wheels were previously listed for $500.00, far too much money in my book and that’s why he hadn’t sold them. The seller’s ad also mentioned how much the wheels would cost new from a dealer, which is irrelevant. The seller now had the rims listed for $375.00 or-best-offer. This was still more than I was willing to pay, and the rims were located in about 60-miles away. Considering the time and gas it was going to consume to procure them, I was willing to offer him $250.00. Like another buddy said, “all he could say was no”. Right before I picked up the phone my new voice of frugality—which has been fighting for a place in my head, and likes to spar with the devil of buy-it-now—whispered in my ear; “what if there is a better set for sale, you better be sure before you buy.” I proceeded to read through all of the results for Toyota wheels, looking for a better deal. On the sixth and last page, listed over a month prior, was a set of wheels for $300.00, or-best-offer. 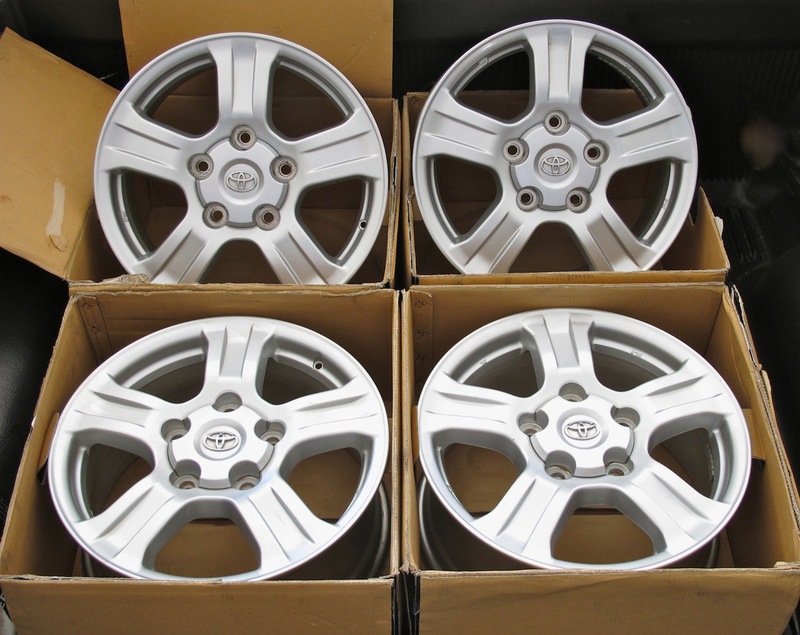 These were the same 18×8″ size, but a different style Toyota aluminum wheel which I actually preferred, and instead of 60-miles away they were literally 1.5-miles near. So I called the guy, confirmed he still had the rims and told him my situation. Essentially that I wasn’t looking to buy wheels but a buddy had told me to look on Craig’s List, and with a chuckle said, “We all know what that can lead to”. The gentleman said he had actually forgot they were listed on Craig’s List until that very morning, they had been for sale for over a month, and he probably needed to re-list them. Like many he had removed them because he added a spacer lift and new aftermarket rims to his truck, after they logged a mere 13,000-miles. I asked him if he would consider $200.00 and he said sure. I went to the bank and a couple hours later I was giddy with new wheels.